"Dark matter fills 'empty' space, strongly interacts with visible matter and is displaced by visible matter." The reason for the mistaken notion the galaxy is missing dark matter is that the galaxy is so diffuse that it doesn't displace the dark matter outward and away from it to the degree that the dark matter is able to push back and cause the stars far away from the galactic center to speed up. It's not that there is no dark matter connected to and neighboring the visible matter. It's that the galaxy has not coalesced enough to displace the dark matter to such an extent that it forms a 'halo' around the galaxy. Galaxies grow via mergers. Each new merger would have its own arbitrary orientation for the two galaxies vs the universe. Older galaxies would have had more randomly oriented mergers, which should result in more randomly orbiting stars, i.e. more "puffiness" - as mentioned very briefly in the middle of the article. It seems like one should a priori expect older galaxies to be more randomized. The real question is how many middle-aged to old spirals there are. These galaxies would have had a lesser-than-normal number of collisions, if your conjecture is correct, @Erik. We'll need a lot of galaxies to be observed to find that out. mack, I don't know of ant way to produce a reasonable answer to your question. How about instead asking "As our technology continues to improve. Enflessly refining the quality of our observations. How does that continuous correction of outdated perceptions, evolve to match the newer reality of the improved data collected? Galaxies grow bigger and puffier as they age: Sir As a student of science not as a scientist I think that galaxies grow puffier as most of the stars have completed their age might have turned into dust cloud after the explosion of neutron star and the forces binding the other stars might have been reduced thus it became puffier. Does it true. @mac, at least you're now *asking* instead of *telling*. You have noted that I did not draw any conclusions. It was deliberate. I think it's far too soon to draw any. Let's see 10,000 galaxies analyzed this way. Then we have something to hypothesize on. @rrwills, we have the technology. What we do not have is the instruments, and the sites. There are only a few sites in the world where ground telescopes of the size and reach needed are even worth installing; and at one of them the locals are having religious obsessions. The hottest thing going is the JWST and they've just delayed it again until 2020. A bunch of congresscritters in the US just sent a trillion dollars to blowing people up and are whining about a few million and then whining about delays because *they* tried to cheap out and didn't allow contingency funds to cover foreseeable delays. Want to get more data? Vote for congresscritters who don't have psychological problems with spending money on science. 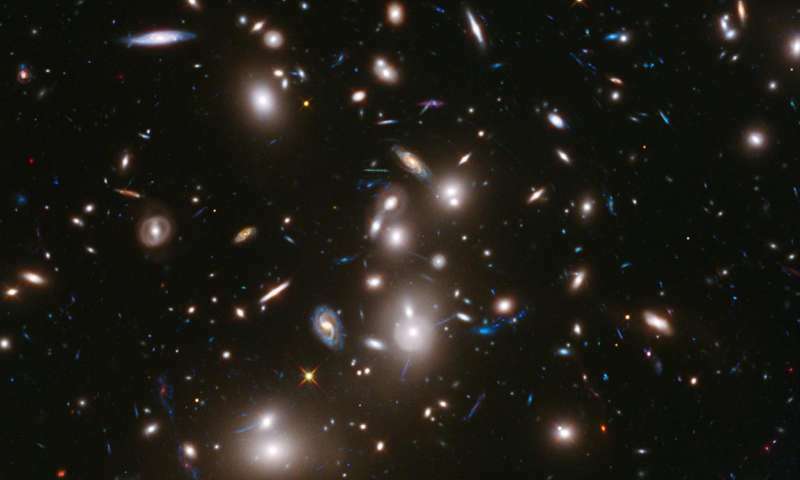 All galaxies look like squashed spheres, but as they grow older they become puffier with stars going around in all directions,"
Since they grow naturally from within by new matter being ejected from their supermassive core stars.